VOLKSWAGEN has built a race car to take the image of electric-powered performance to new heights … 4302 metres, to be precise. This is the finish-line altitude of the legendary Pikes Peak hillclimb. The purpose-designed, single-seat I.D. 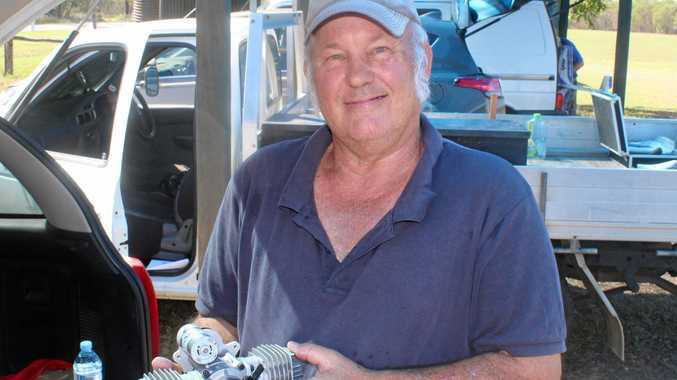 R Pikes Peak will compete in the annual 20km dash to the summit of the Colorado mountain. 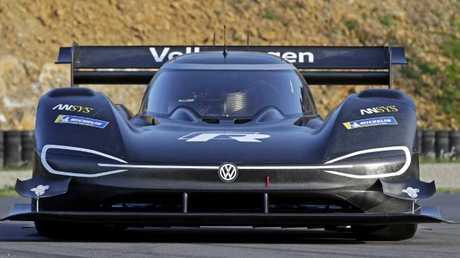 VW Motorsport says its aim is to beat the Pikes Peak electric vehicle record of 8 minutes 57.118 seconds, set in 2016. There's a chance the battery-powered racer with the monster wing will be the fastest car of all to the top of the mountain on June 24 but will need to be 45 seconds quicker again. "I'm convinced that we can do very, very well," says Romain Dumas, who will drive the Volkswagen. The 40-year-old Frenchman knows what he's talking about, having raced up Pikes Peak five times and won there three times, most recently last year. Dumas is best known for endurance racing. Twice he's been in the winning team at the 24 Hours of Le Mans, first with Audi then Porsche. He was part of Porsche's FIA World Endurance Championship winning team in 2016. He has done three tough Dakar Rallys, driving Peugeots, and competed in numerous other categories during his career. "Pikes Peak, in electric, is the best concept you can have, in terms of performance," says Dumas. "Why? Because you don't lose power." Air gets thinner with increasing altitude. This, by the way, is the reason Pikes Peak racers wear XL-size aero aids. Thin air also means less oxygen to burn fuel, so the power of internal combustion engines fades as they climb. Compared to sea level, where air is densest, a normal engine's power is reduced by almost 30 per cent at the Pikes Peak start line. At 2862 metres, it's more than 500m higher than the summit of Mount Kosciuszko, Australia's tallest mountain. By the finish line, more than 1400m higher again, power is down more than 40 per cent. Electric motors are completely unaffected by altitude. "You have the disadvantage of weight, this is for sure," Dumas says. But batteries that can hold enough energy for the relatively short sprint up Pikes Peak aren't too heavy. The I.D. 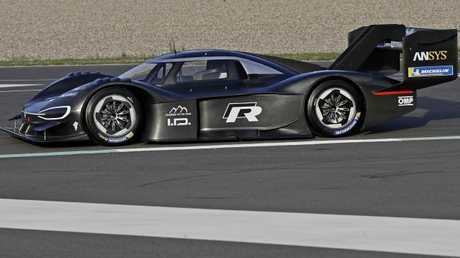 R Pikes Peak will weigh less than 1100kg, less than a typical small hatchback, ready to race and with driver Dumas aboard. Volkswagen Motorsport in Hanover designed and built the racer, choosing carbon-fibre for the chassis and bodywork, with race-car grade suspension and brakes. Maximum power of the long, low and light all-wheel drive I.D. R is 500kW, delivered by two electric motors, the more powerful of the pair driving the rear wheels. 2.3 seconds, faster than a Formula One car, on to a top speed of 240km/h. It may be named to promote VW's coming line-up of I.D. 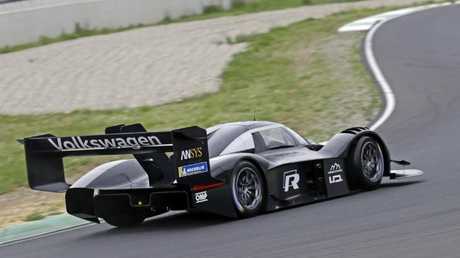 electric cars and its R performance division but the racer doesn't use any road car technology. Not even its batteries. "We need the batteries to provide the best power density they can," says technical director Francois-Xavier "FX" Demaison. Road-going EV batteries need high energy density, which delivers a decent driving range. But, just like a Nissan Leaf or BMW i3, the I.D. R Pikes Peak will use regenerative braking. 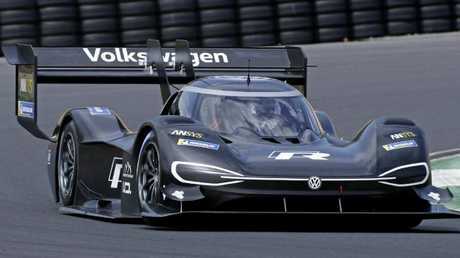 Slowing for the course's 156 turns, Volkswagen Motorsport calculates, will provide 20 per cent of the energy consumed during its assault on the peak. 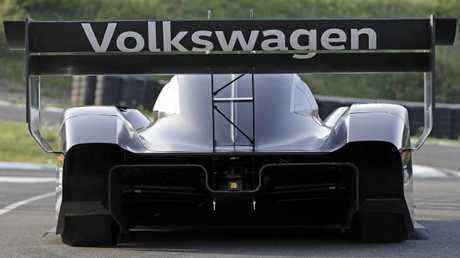 One of the tasks on Volkswagen Motorsport's to-do list as it preps the I.D. R for Pikes Peak is what the car should sound like. Event organisers Broadmoor PPIHC have a safety requirement that EV entries must make 120dB worth of noise. This is way more than they naturally make. Tech director "FX" Demaison knows one thing for sure … his car won't be made to sound as if it's powered by internal combustion.